On 20 Nov 1909, at the age of seventy; in Garryharry, Churchill, Co. Donegal, Fanny Sweeney, a farmers widow; passed away. Her son John was the informant of her death. She was my 2nd great grandmother, mother to Lizzie Sweeney, who married my great grandfather Thomas Murdock. Fanny, a child of James Robinson and an unknown mother (her name currently remains elusive) was born about 1839 in Co. Donegal. In 1859 she married James Baxter Sweeney in the Ramelton 1st Presbyterian Church; a Twisted Limb that I followed (literally) back to Ireland in the summer of 2014! My recent research now has me exploring my Robinson ancestors; following this particular Crooked Branch back one more generation! 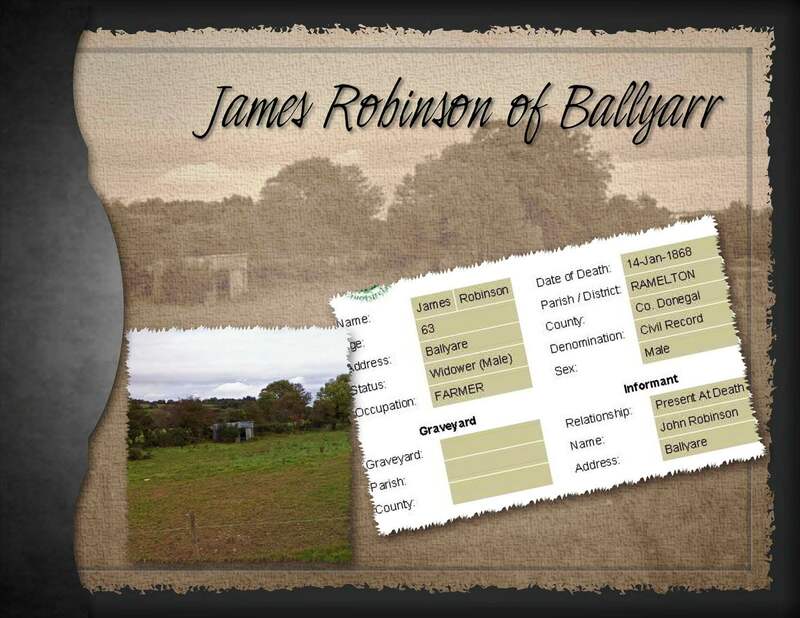 The marriage record of Fanny Robinson and James Baxter Sweeney reveals that the Robinsons lived in Ballyarr, Co. Donegal in 1859; and her father James was a farmer. In turn, the Griffiths Valuation record of 1858 confirmed that James Robinson (my 3rd great grandfather) was leasing plots 11 and 12 from Thomas Patterson. The Robinson farm was located in the Town land of Ballyarr, Parish of Tullyfern, Union of Milford, Barony of Kilmacrenan in Co. Donegal. 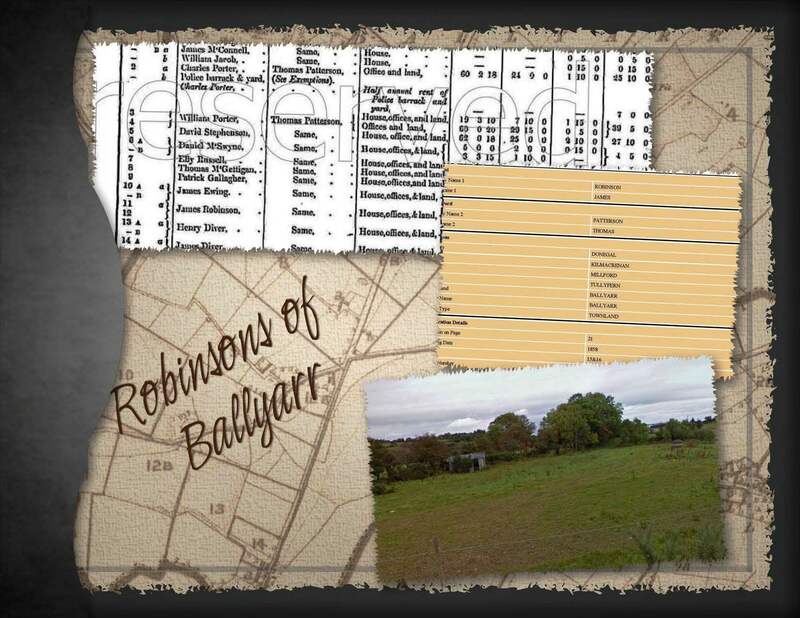 The Census Record shows that only one Robinson was still living in Ballayar in 1901. Hannah Stewart (70 yrs) was listed as a widow and the head of the family. She was living with her daughter Jane Robinson (26 yrs) and her niece Mary Tease (14 yrs) at 5 Ballyarr! Hmm… so, where does Jane fit? 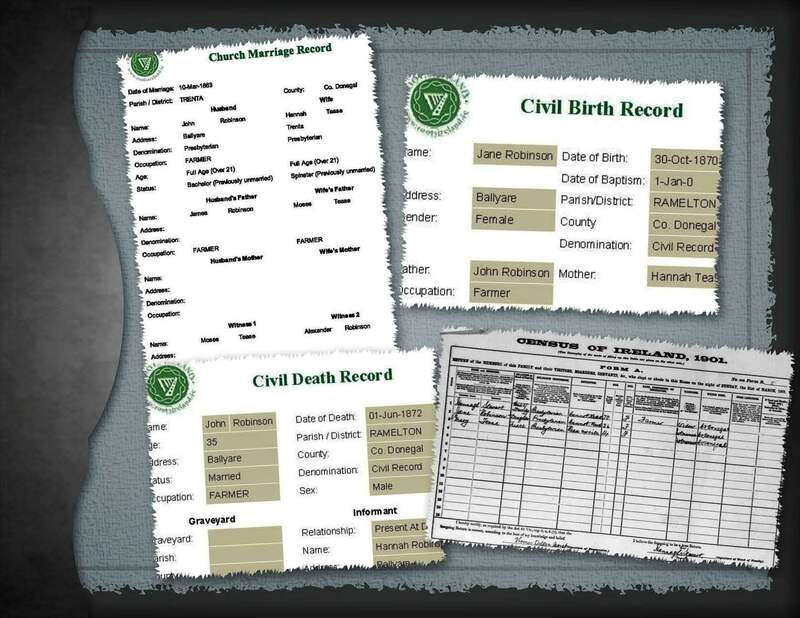 A Civil Birth Record for Jane Robinson of “Ballyare” was unearthed. Jane, my 1st cousin 3 times removed; was born on 30 Oct 1870 to John Robinson and Hannah “Teas”. The record also revealed that John was a farmer. John Robinson and Hannah “Tease” were married on 10 Mar 1863 in the Parish of Trenta, Co. Donegal. John was a farmer, as were his father James and father in law Moses. Moses Tease and Alexander Robinson witnessed their union. Another clue was discovered in the Church Marriage Record! Who is Alexander Robinson? Is he another of my 2nd great uncles that I had been previously unaware of? The search will continue for Alexander! Further “hunting” led me to the Civil Death Record of John Robinson, my 2nd great uncle; who sadly passed away much too young at the age of 35. His wife, Hannah Robinson, was present at his death, on 1 Jun 1872. Almost 10 years later, on 7 Feb 1882; Hannah Robinson of Ballyarr married William Stewart of Breen. Sadly, by the time the 1901 Census was taken… Hannah Stewart of 5 Ballyarr was a widow once again! There is no question the 1901 Census of the residents at 5 Ballyarr became somewhat of a “Gold Mine” for me! 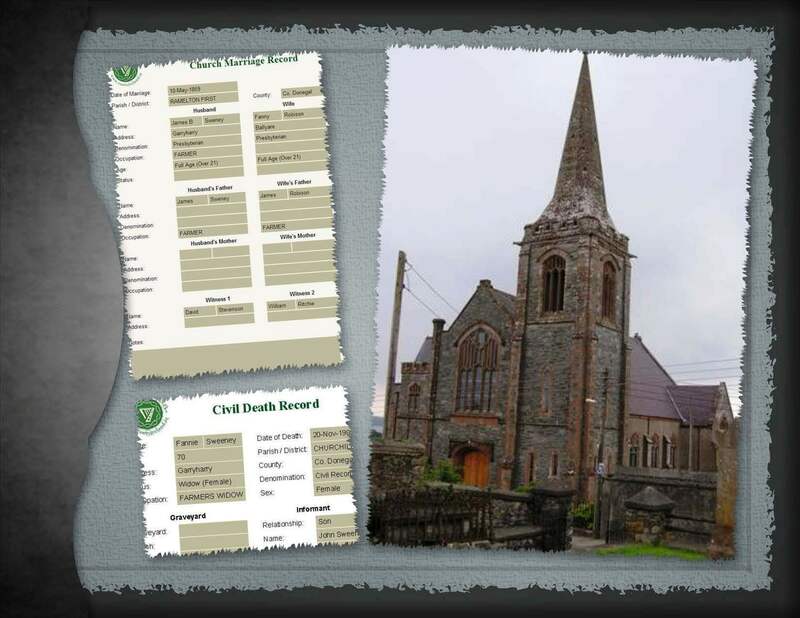 This entry was posted in Burial Records, Co. Donegal, Geneaology, Ireland and tagged Co. Donegal, Family History, Garryharry, GeneaBlogger Daily Blogging Prompt, Genealogy; Ireland; Records, Robinson Family, Sweeney Family. Bookmark the permalink. 3 Responses to The Robinsons of Ballyarr! Tease is an unusual surname but there is one in the 1911 census boarding with a Stewart family in Derry, maybe related?